Melbourne University Press, proud publisher of Mick Gatto’s memoirs and much other recent pulp, has been in the news of late, following what has been widely described as the “resignation” of chief executive Louise Adler and a board whose members included Gillian Triggs and Bob Carr. The Left works on the theory that, once it has conquered and colonised an institution, the march ever forward cannot be reversed. No surprise, therefore, that a claque of angry comrades is frothing with fury. The government of Victorian Premier Daniel Andrews is incensed, demanding the university, whose million dollars a year in subsidies allowed the publisher to claim a paper profit of some $250,000 in the last reporting period, reverse its decision. All up, according to The Australian, MUP has swallowed $26 million over the past 15 years. 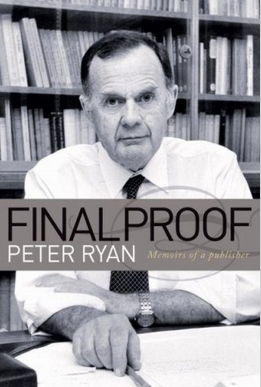 Those interested in the debasement of a once-august imprint will find the memoir of former publisher, author and Quadrant columnist, the late Peter Ryan, worthwhile reading in following the transition from excellence to excrescence. That volume, pictured above, can be ordered here. And something else that makes interesting reading is MUP’s latest statement (2017) of its financial affairs, as lodged with the Australian Charities Commission. Among the outgoing expenses is an entry for $669,807 paid to four executive officers.